Janice over at the Vivienne Files had a post this week on making your closet feel like the clothes shopping experience you love most – in other words, bringing light, space, and visual appeal to your clothes storage area. One of the big ways she achieves this is with wooden hangers, and I have to say, I agree with her. 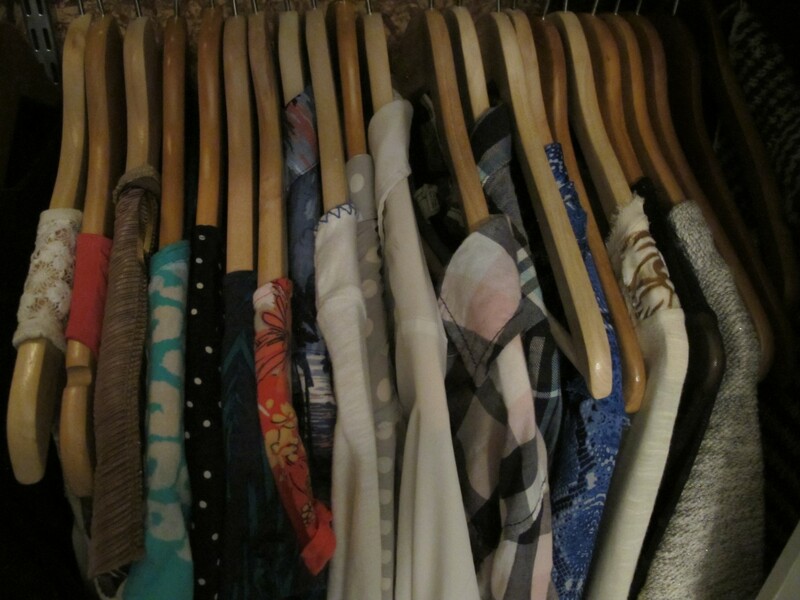 Having my clothes all on similar, lovely-looking hangers helps make me feel closet-happy. Wooden hangers take up enough space that you’re reminded not to crowd the rack, which is also a big contributor to me loving the way my closet looks. Another surefire closet-happiness booster? Having a cohesive color palette. Our closet is open, so I see it every time I walk into the master bathroom; I notice when a color is glaringly out of place or the racks are packed to the gills, and take a moment to decide whether it’s time to weed through my wardrobe again. Going back to hangers: best of all, all my lovely hangers are thrifted – folks cleaning out their closets tend to donate in packs so I’ve been able to assemble very similar hangers for all my hanging garments. Check your local thrift store to see what you can find! Read more about my love for wooden hangers here.